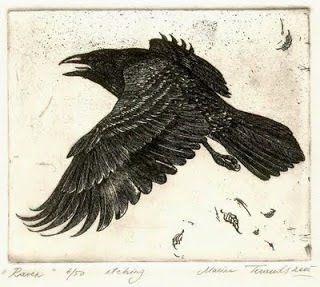 A French tradition holds that bad priests become Ravens and bad nuns become Crows. 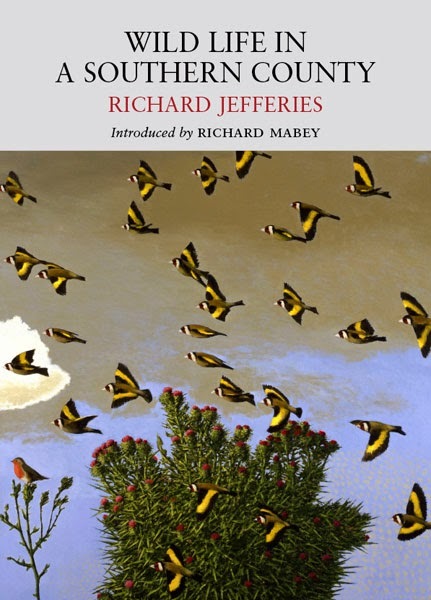 Many people talk of Ravens and other crows with a certain innate knowledge, often detailing things you wouldn't necessarily find in ornithological texts. Most texts will however relate to the 'folk lore' of crows and Ravens with depictions dating back a thousand years, providing evidence of long associations and affinities with Royalty and Peasantry alike. The presence of Ravens above Centenary Wood and around Moor Green over the past few days is significant in terms of natural adaptation; my book, 'The Crows', from 1978, suggests that Ravens are "confined to - Scotland - the Shetlands, Orkneys and Scottish islands; the Lake District and part of the north Pennines, Wales, Devon and Cornwall with a few other scattered areas." Possibly the most spectacular of the early springtime changes is the behaviour of birds, many of them becoming more noticeable as they call, sing, postulate, display and fight; and these behaviours are arguably more exciting when the crows come out to play. 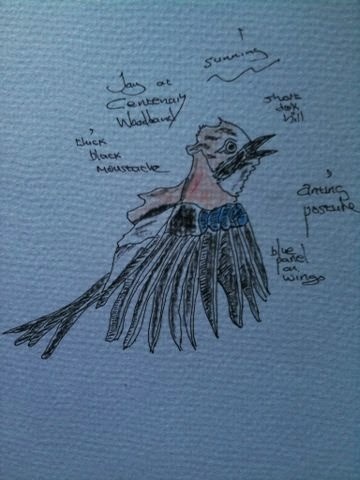 Yesterday, over Centenary Woodland, a relatively new Corvid came on the block when a pair of Ravens briefly made reconnoissance, their deep guttural 'cronk' drawing attention as they lazily floated across the patch, this was soon followed by a cacophony of cawing, hacking, chattering and kyacking as the locals received the news and made calls to order before closing in noisily. 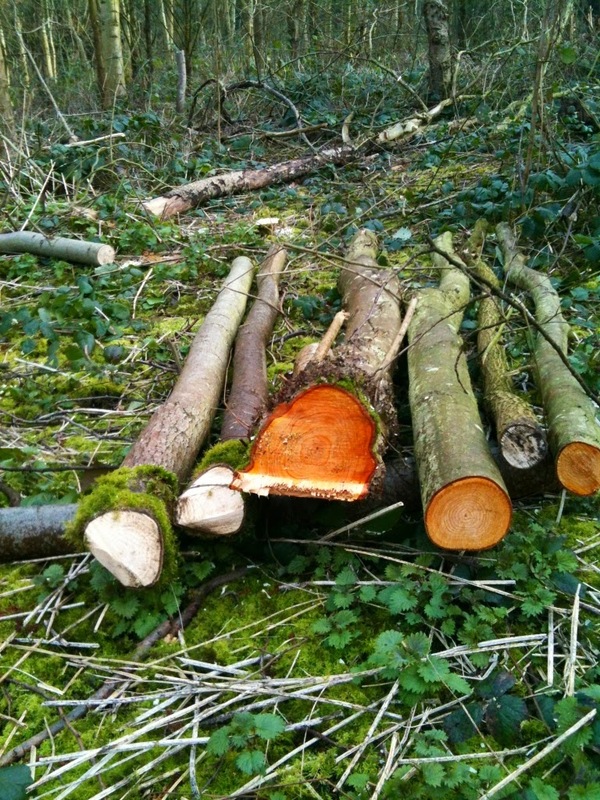 During the last week of March, final touches for the season will be added to the woodland with a combination of tree and plug planting together with wildflower seed sowing. Still waiting to see the species list but the area would certainly improve with the addition of more hazel. 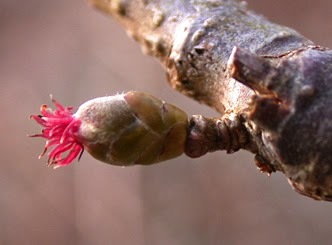 (Corylus avellana). This plant is a real woodland favourite for many and has been a human resource for centuries in the British Isles, mentioned in almost every commentary on Ancient Woodland and woodland management. 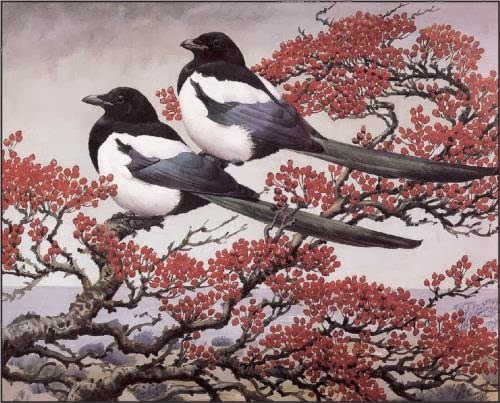 and crows were frantic as they battled for supremacy; Jays, Jackdaws, Magpies and Carrion Crows fought arial battles and chattered incessantly, cavorting and caroling on top of the woodland. 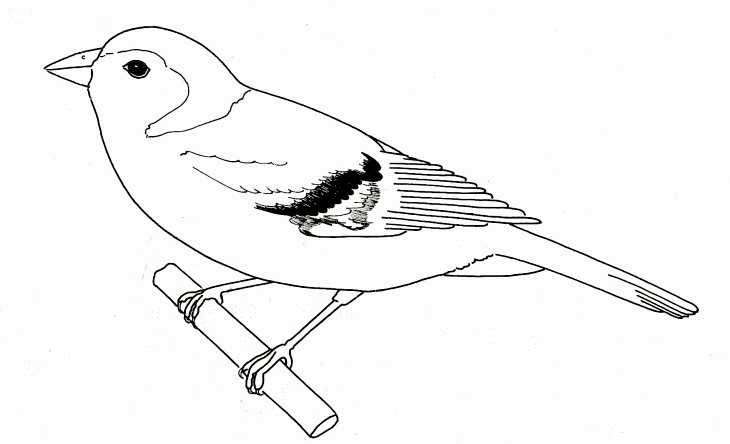 I hope no-one is getting too serious regarding the choice of illustration for the selected birds of Centenary Woodland, most are cribbed from the internet, as is this one of a Chaffinch; nothing like a Chaffinch, I hear you, and I agree, for there is no colour, yet the proportions and topography are recognisable as finch, with the cap and nape contour suggesting Chaffinch. 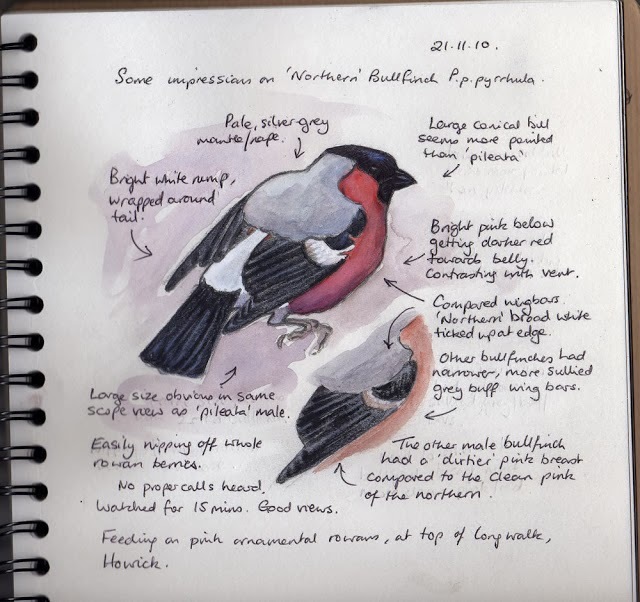 Very active in Centenary Woodland at the moment, and like many other birds, often seen picking morsels from the woodland floor, maybe seeds or insects for they feed on both according to time of year and availability. "Very pretty but common as muck. The scrounger of crisp crumbs, they loiter round car-parks at beauty-spots and even before you’ve got your boots off they’re at your car and after your lunch. Not that they will take a bit from your hand, they’re not that brave." Cannon Hill Park contains a 5.2 acre woodland known as Centenary Woodland, planted in 1989 to commemorate the centenary of both the RSPB and Birmingham City Council. Centenary Woodland is situated southwest of 'The Russells', (centre of map), and north of Moor Green Allotments, north and west of Goodby Road, (bottom of map). The woodland today contains a closed canopy of mixed broadleaf trees and a swathe of Scots Pine. The 'under' wood is generally poor with few woodland flowers apart from erroneously introduced Spanish Bluebell and a few other non native species such as soapwort, which is probably a garden escapee. Jay spotted this morning, sunning in the open woodland, taking advantage of early morning warmth penetrating the woodland canopy. Normally associated with anting posture. 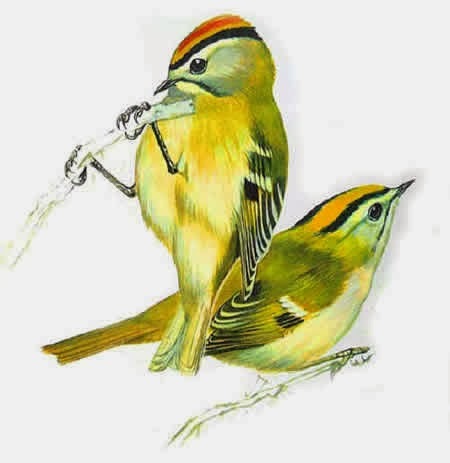 The two birds I was viewing in Centenary woodland were juvenile, lacking the bold head stripe depicted in this image. I was puzzled initially, and without binoculars, had to concentrate the focus by cupping hands around the eyes to determine as much detail as possible. The birds were 'little brown jobs' and although I recognised the movement and character associated with Goldcrest, it took me a little while to decide they were juvenile, and no where near as striking as this image. The yellow head stripe only evident as the birds landed on the trunk of a Silver Birch tree just a few feet away. The skull was attached to the rest of the skeleton, and separated from the backbone by a volunteer on the suggestion that he take it home to his son to scrutinize over dinner.